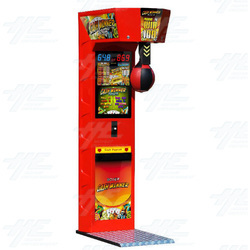 Cashwinner is a SWP (skill with prize) boxer machine with coin payout system. Players strike the punch ball in order to spin the onscreen slot machine. The machine will payout for every triple number score (eg. 111, 222, 333 etc) as well as the best score. The machine will dispense Minor payouts (5-20 coins) and Major payouts (20-100 coins). The quantity of the Major payout will increase as the jackpot grows. The Cashwinner machine features a servo-mechanism ball release, a 17 inch wide screen LCD screen and 5.5 inch speakers. The machine software gives operators the option to regulate the volume, credits, power correction, time correction, jackpot-grow ratio, best score limit, record drop-down delay, record drop-down value, record reset, credits reset and default settings. The machine will payout for every triple number score (eg. 111, 222, 333 etc) as well as the best score. The machine will dispense Minor payouts (5-20 coins) and Major payouts (20-100 coins). The quantity of the Major payout will increase as the jackpot grows. The Cashwinner machine features a servo-mechanism ball release, a 17 inch wide screen LCD screen and 5.5 inch speakers. The machine software gives operators the option to regulate the volume, credits, power correction, time correction, jackpot-grow ratio, best score limit, record drop-down delay, record drop-down value, record reset, credits reset and default settings.